After bravely supporting the rebellion through battle after battle, R2-D2 has earned his place on the side of a Japan All Nippon Airways airliner. But besides appearing in a couple of teaser trailers and at a handful of public events, has the rolling BB-8 droid earned the same honor? 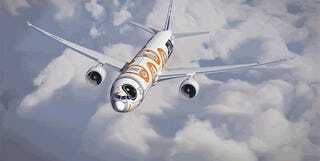 We’ll probably have to wait for Star Wars: The Force Awakens to know for sure, but as part of ANA’s ongoing Star Wars project, the Japanese airliner has just added two additional droid-branded jets to its fleet, included one wrapped in BB-8 livery.